Its name has become nearly synonymous with horror and mystery, but despite its reputation, the Bellevue Hospital still stands. As the oldest public hospital in the United States, it’s had its share of scandalous stories that could fill political news magazines, but not all of them are grotesque. Perhaps Bellevue’s greatest secret is that it pioneered some of the most important innovations in medicine. Bellevue began as a small two-story “pest house,” which is essentially where the sick go to die. Located on the East River in New York, the Bel-Vue estate housed yellow fever patients in the 1790’s. If you ended up there, it meant you were too sick to recover. 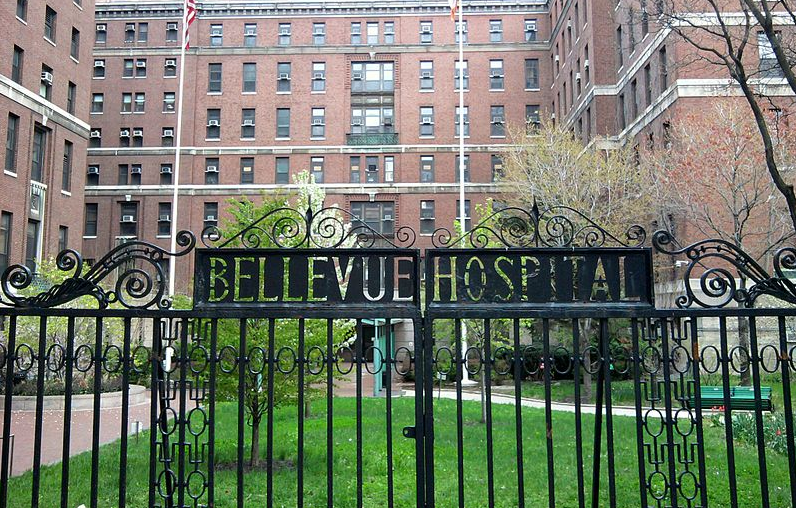 After the epidemic passed, the city bought the building and renamed it Bellevue Hospital. Most hospitals in New York City were used almost exclusively by the upper classes. Bellevue, however, didn’t turn anyone away. This overcrowding led to appalling conditions. Everyone from abandoned children to alcoholics to the mentally-ill slept three to a bed, or on the floor. In the mid-1800’s, 48% of amputations resulted in death, which seems really high, but wasn’t unusual for the time. In 1881, a gunshot President James Garfield received treatment by the lead surgeon from Bellevue. The doctor promptly stuck his unwashed fingers into the wound and didn’t use clean instruments. Garfield didn’t die from the gunshot wounds; he died from infection. However, many younger surgeons at Bellevue pushed for recognition of germ theory before their peers. Progress arrived in other ways, too. In 1869, Bellevue established the nation’s first ambulance service. Drawn by horses, the ambulances rang a gong to signal their arrival and offered patients brandy to relieve their pain. Bellevue was also the first hospital in the US to have a maternity ward and the first to use hypodermic syringes. Bellevue’s inclination towards medical innovation had its dark moments, too. Serving as head of the children’s psychiatric unit in 1934, Lauretta Bender was one of the first researchers to believe mental disorders in kids weren’t caused by their upbringing or “bad behavior.” She focused on autism, which most at the time blamed on “neglectful” mothers. Tragically, Bender also believed electric shock treatment was the solution. Children as young as 4-years old endured the procedure. The psychiatric ward at Bellevue has the darkest reputation, and people are often unaware that the hospital had other services. In 1972, journalist Geraldo Rivera exposed the horrific conditions at Willowbrook on Staten Island, and Bellevue moved their psych ward into a newer, better building, leaving the original abandoned. In pop culture, the legacy of Bellevue psychiatry lives on in any horror movie involving mental illness and asylums. Author David Oshinsky, who lives near the famous institution, holds a very positive opinion on the hospital. He points out that the bad conditions and high death toll that stretch across its history are due to the fact Bellevue was the only hospital taking certain groups in. In the 1930’s, it served the Irish population struck by cholera, and during a time when it seemed no one would treat AIDS patients, Bellevue operated the first AIDS clinic. More AIDS patients died there any other hospital, but they were also taking in the most. “Bellevue will always be here,” Oshinsky says, and he’s glad about that. For more stories on how political news magazines and medicine intersect, check out this article on Rosemary Kennedy’s lobotomy. Roller Coaster Stock Market: The New Normal?